Being told to dress smartly when you still want to appear fashionable and casual can be a challenge, however there are some simple tips you can keep in mind when planning your outfit. Scroll to Step 1 to find out how you can look good, feel comfortable, and dress to impress. Choose a top. That picture is an example of something that does not look good. Low cut with a camisole underneath is very in. Avoid being too dressy . Choose your bottoms. You could always opt for some smart pants, but if you want to look a little more feminine, try wearing a skirt. Plain black skirts soften your outfit if you have a bold top on, but if not, try a ruffle skirt. These look smart and casual, and also look great on all figures. You may want to wear plain tights if your skirt looks a little too short, too. Choose your shoes. Flat ballerina type shoes are always a good option, but finding a great pair to match your outfit makes you look great. Don't go to exotic though, your shoes should be simple yet have some personality to them. Heels can also look good, but remember, you're going for a casual look. Lightly accessorize. A small pair of earrings and a necklace should do, maybe a small handbag. If weather permits, wear an overcoat. A simple mackintosh always works well. Ensure that everything you wear is in good condition. Smile and make sure you've brushed your teeth properly. Make sure you are well groomed. Looks aren't everything, make sure that you have the great personality to go with your looks. Keep your colour scheme neutral. 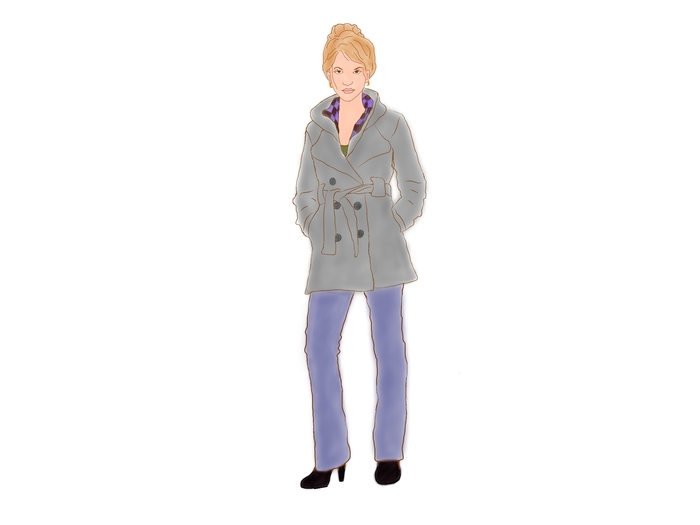 Try to wear a jacket over a shirt or top to get a smart look and tie your hair in a high ponytail . A watch would go very awesome with the look!